This is a great Mid Century Modern aqua/turquoise and clear blown glass vase. It is signed.see last picture. It looks to have the production number next to the signature. You really have to look close to see them. Just out of a local smoke free house is thisMid Century Modern art glass vase. It was designed by Tamara Aladin for Riihimaki Lasi in Finland. It was reportedly produced from 1968 to 1976. Designed by Gote Augustsson. Height 12,5 cm ~ 5", width 15 cm ~ 6", weight 1,380 kg. Australia & New Zealand. This small blue vase is made in Denmark by Holmegaard. It measures 3.25” tall by 3.25” wide. There are no flaws or chips. Minute scratches, color variances, straw marks, bubbles, swirls, or smudges are inherent to antique glassware and collectibles. Here are a great PAIR of Riihimaki Finnish vases. They are blown glass. The body features an "ice" texture, and the color is a smoke color with a bluish/greenish tinge to it. They have weighted bases for added stability. The color is so vibrant. The vase features an explosion of various sized bubbles and striations throughout in a beautiful blue color. It is signed Strombergshyttan, what looks like Nyland and numbered B1062 on the bottom as shown. Kosta Boda Bertil Vallien Satellite Vase Signed 12"
Signed by Bertil Vallien. Kosta Boda. and is signed and numbered on the base and complete with original box. This piece is signed and dated 1957 with the PL initials. It does, however, have a few bottom scratches but does not distract from its amazing beauty. It is just gorgeous with its clear icy arctic blue color and mid-century biomorphic flowing tricorn or trilobed shape. The vase is in good estate condition with minor scratching on the bottom of the vase due to use. Circa 1950's. Kosta Boda Blue Studio Art Glass Zoom Bowl Center Piece Signed Goran Warff 14"
The shapes of the Vision collection likens the human eye, while the soft, transparent color creates the sense of an imaginary eye. Soft, undulating shapes make Göran Wärff’s Vision an elegant classic for Kosta Boda. Overall a nice, clean piece with a slight touch of scaling to the inside from previous use. This set of two cobalt blue vases each has a clear glass "bubble" bottom and a lovely color. One of the vases is a slightly deeper blue color than the other. Kivi is available in several different colors, each with their own special Iittala glass recipe. Colours are Rain (Blue), Sand (Brown) and Apple Green. The candleholders are new in their original box and still have their labels and Iittala stickers. It is signed J Fors Orup. SIgned and numbered by craftsman on the bottom. 12 cm high and 8 cm wide. Etched with flowers. no scratches or bubbles, MINT condition / RARE. Rustica - series was designed in1963 and was manufactured until 1970 in Nuutajärvi glass factory, Finland. Glasses arethin and delicate glass by the masterKaj Franck. Three colors: clear, gray and blue. Vintage Holmegaard Glass Blue Vase, Denmark, Mid-Century Modern Design. This vase measures 10 inches tall and is 3 inches at its widest. Excellent condition, no chips. Shipped with USPS Priority Mail. Design by Timo Sarpaneva in 1956 and manufactured in Iittala Glass Factory until 1968. Signed "Timo Sarpaneva 2501". FM Ronneby 20th Century Swedish Art Glass Paperweight Josef Marcolin 1988? It is signed on the bottom FM Ronneby Sweden M388. The M denotes it to be by Josef. It has one small area with abrasions on it. EXCELLENT DESIGN. GOOD CONDITION, MINOR SURFACE SCRATCHES. Nice Holmegaard glass piggy bank by Jacob E. Bang. The color is an aqua blue. It measures approximately 6” long by 4” wide by 4-1/4 “ tall. It is in very good vintage condition with a little dirt on the inside of the banks “feet.”I have not attempted to clean it. It also retains a partial label. 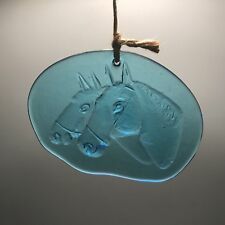 Nice piece of Danish modern glass design. HEIKKI ORVOLA DESIGN 1988. KIVI PATTERN. VOTIVE CANDLE HOLDER. Signed and numbered to the Base with Engraving "kosta 441834". Weight: 546 grams. Design by Timo Sarpaneva in 1956 and manufactured in Iittala Glass Factory until 1968. Signed "Timo Sarpaneva 2501". i-color series was a set of 4 different colors used by Iittala in 1950's. 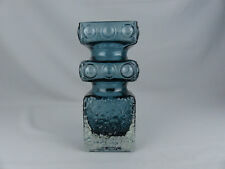 Rare Orrefors Vintage Turquoise Drop Formed Vase, mid 20th Century, marked. Marked "Orrefors 1437" underneath and green "Orrefors Sweden" Label on the lower side. which can be expected due to the age of the vase (see photos). Color - Blue. We are not experts. Designed by Timo Sarpaneva in 1956 and manufactured in Iittala Glass Factory until 1968. Color is Blue. In great used condition with only small signs of use. This beautiful midnight blue glass vase was designed by Kaj Franck in 1957 and in production from 1957-1969. Design/model number KF245. We had a total of six Kaj Franck blue vases. Five have previously sold. These 6 glasses appear new and unused. Each has its original label attached. One glass has a small excess of glass which can be felt. It is shown in the last 2 pictures. The color appears a teal/aqua blue. 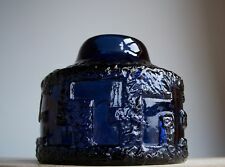 It is finely made of Kobalt Blue Glass and was designed by KOSTA BODA Artist Vicke Lindstrand. The Plate is signed and marked to the Base. Weight: 548 grams. Design by Timo Sarpaneva in 1960's and manufactured in Iittala Glass Factory. Signed TS for the initials of Timo Sarpaneva. i-glass series, bottle model A, blue in color. One bowl has tiny flea bite in the rim. Otherwise in good used condition with only small signs of use. Six pieces. Blue in color. Designed and manufactured in 1950's at Nuutajärvi glass factory. Type: mouth blown flower glass vase. Model: Dråbevase - Water Drop Vase. 1 week for U.S. and world. Color: thick sapphire blue glass. Design: Per Lütken.